We’d be hard-pressed to fit all of the overwhelmingly positive feedback that Jonathan has received over the years into this single blog post. Why? That’s because so many individuals and companies have explicitly raved about Jonathan The Drone Guy and his unmatched drone photography and videography services in the greater Los Angeles area. If you or someone you know has been in need of wedding drone photography or video, real estate drone photography, or drone coverage for the entertainment industry, the chances are strong that Jonathan has been on the job. Of course, you’ll see Jonathan expertly flying his arsenal of drones around Southern California for a number of good reasons. Not only does Jonathan boast a decade of experience capturing music videos and working in the entertainment industry, but he also has the real estate background necessary to help realtors market their listings, increase their clientele, and ultimately, drive conversions through the power of real estate drone marketing. He’s also made countless newlyweds thrilled about their wedding coverage by taking advantage of the unique, aerial perspective that wedding drone videography is known for. All things considered, Jonathan is honored to have built and developed countless relationships with professionals and Los Angeles residents alike. What this means is that, as we explained above, countless testimonials have surfaced — and Jonathan and his team are very grateful for the abundance of feedback! That’s why we wanted to take a big step back and highlight several customer experiences in today’s blog post. So, whether you’re in need of real estate footage, breathtaking wedding shots, entertainment production, or you fit in with any of the other industries that Jonathan The Drone Guy serves, read below to get a better idea of what your experience will be like working with a seasoned drone pilot like Jonathan. We’re excited to help you grow your business and your ideas! Contact Jonathan The Drone Guy directly to get started at any time. An enticing property description and a few photos of the inside simply won’t cut it for a real estate listing these days. Experienced real estate professionals like Terry S. know firsthand just how much the industry has changed over the decades, and these days, impressions begin online. By creating a “virtual tour” of sorts with real estate drone video, coupled with incredible aerial shots that showcase what the entire property looks like, you’ll be able to create an unbeatable listing that converts would-be buyers into happy homeowners. Thank you kindly for the great review, Terry! We are incredibly thrilled about your experience with us, Emil! Thank you for reflecting on how responsive Jonathan was after reaching out to multiple companies with the same email. It’s not uncommon for businesses to be so…well, busy that they just don’t have the time or the resources to reach back out to customer inquiries in a timely manner. To Jonathan The Drone Guy and his team, even a simple inquiry is important business to us, and we don’t want to treat you any less than our biggest project. Your time is our time. “It was New Year’s Eve Eve and I made one call to Jonathan who was extremely responsive and was able to get my 2 jobs done in less than 1 day. Jonathan put all the pictures on a convenient flash drive and dropped it off at my office. The pictures were high quality and perfect. He knew exactly what I needed and just GOT IT DONE! As we emphasized above, Jonathan has worn many hats over the years — both personally and professionally. This results in a well-rounded drone photographer who understands what your unique needs are, and then immediately puts them into practice to help turn your artistic vision into a deliverable product. The convenient flash drive only adds icing to the already-sweet cake. Your review was very well-put; thank you, Kirk! It’s not every day that Jonathan The Drone Guy and his team gets to shoot footage of 39 exciting kindergarteners, but when we do, we’re extremely grateful for the opportunity! We’re also thrilled that you appreciate the immediate turnaround time that Jonathan is able to offer his customers (depending on the nature of the project). Thank you for taking the time to share your experience working with Jonathan’s drone video services, Ellie. 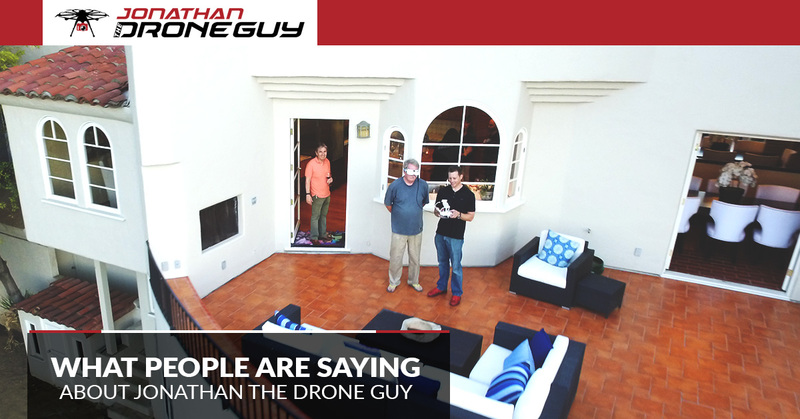 Become Jonathan The Drone Guy’s Next Success Story! It’s no secret that drone photography and videography are becoming the new media standard, and you don’t have to be here in Los Angeles to know that, either. Do you have a unique idea or an artistic vision that you’d like to bring to life? We can help! Contact Jonathan The Drone Guy and his team of drone professionals today to get started.